A beautiful series inspired by Our Lady to the 3 shepherd children who were first welcomed by the angel of Portugal to prepare them for her message for them to carry to the world. 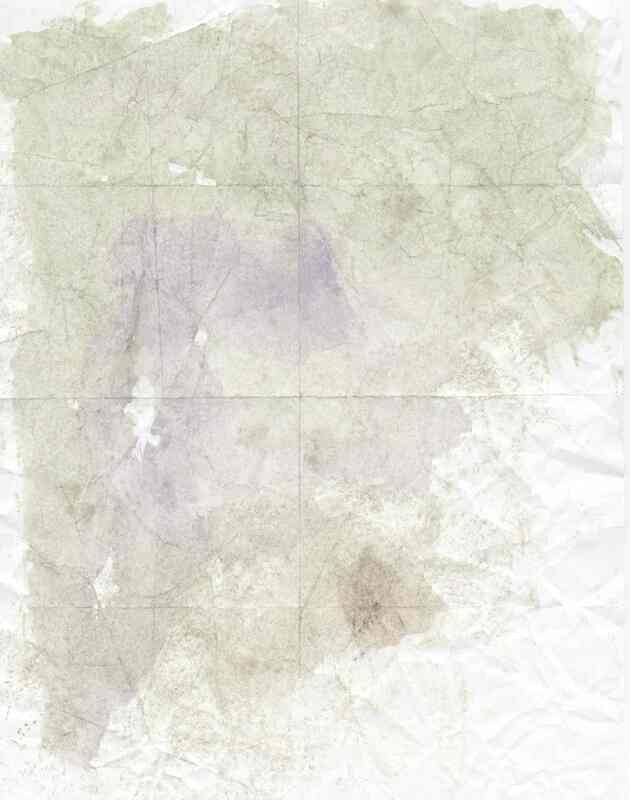 'O my Jesus, forgive us [our sins], save us from the fire of hell. Lead all souls to heaven, especially those who are most in need. [of thy mercy]' "
"Unless you change and become like little children you will never enter the Kingdom of Heaven"
Her Fatima message was a precursor of what was to come. Sent from God, she gave a series of 6 messages to the children - to a world filled with sin and the great war that was in progress- (WW I 1914 - 1918 - in which 37 million people died - taking out a a whole generation of people) - yet to be followed by a greater war, WWII. "When you see a night illumined by an unknown light, know that this is the great sign given you by God that he is about to punish the world". And on 25 January, 1938 most of Europe saw a remarkable display of aurora borealis in the sky - just one year before World War II began in 1939." Our Holy Father, Pope Francis has 'quietly and prayerfully consecrated his papacy to Our lady of Fatima. Our Work is to find out why. And ask ourselves, 'what are we missing?' Our call is to listen to her messages in a deeper way so as to understand them better and how to apply her messages to our lives. One of the first things we can do is to bring out our old rosary, dust it off - and pray, pray, pray. about praying the rosary - tradition? INSPIRED BY THE ANGEL'S MESSAGE THAT BRINGS US TO OUR KNEES EVERY TIME WE HEAR IT. "Do not be afraid. I am the angel of peace. Pray with me." "My God, I believe, I adore, I hope, and I love You. do not adore, do not hope, and do not love You." then encased in a 12 mm faceted crystal bead. 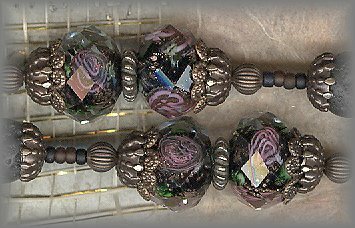 Antiqued filigrees cap each bead. 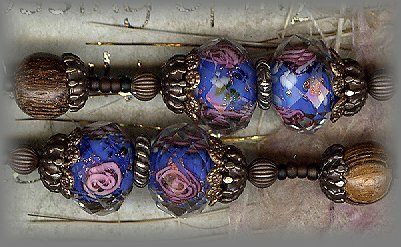 INSPIRED THIS FIRST GROUP OF ROSEBUD BEADS. "you are a chosen race, a royal priesthood, a holy nation, a people of his own, so that you may announce the praises of him who called you out of darkness into his wonderful light." 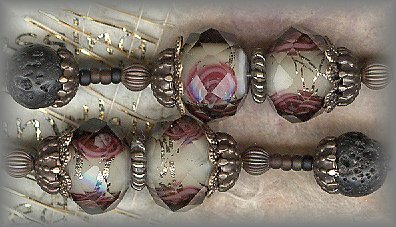 8mm Lava / Amethyst faceted crystal: PATER BEAD: A white lampwork bead is set with 2 hand made rosebuds. 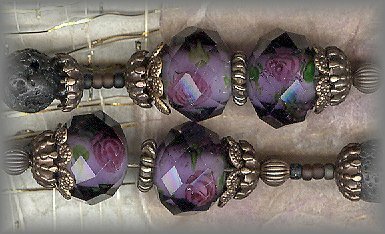 Each bead is thenenclosed in an amethyst faceted crystal. 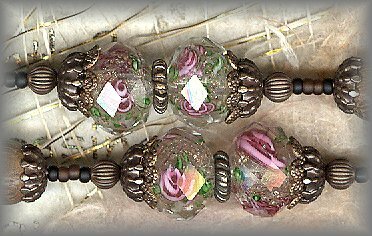 We have added antiqued filigree caps on each side to complete their beauty. AVE BEAD: Natural lava rock, gemstone grade, matte black, 8 mm round, B grade, Mohs hardness 3 to 3-1/2. (We have used these lava beads for years with no problems.) 24 in. "What are you doing? You must pray! Pray! The hearts of Jesus and Mary have merciful designs for you. You must offer your prayers and sacrifices to God, the Most High." "In every way you can offer sacrifice to God in reparation for the sins by which He is offended, and in supplication for sinners. In this way you will bring peace to our country, for I am its guardian angel, the Angel of Portugal. Above all, bear and accept with patience the sufferings God will send you." Faceted CrystalCrystal over white with silver foil. At Fatima, Mary revealed herself as 'Our Lady of the Rosary' emphasizing the praying of the rosary daily to all of her children. Today, we are called to pick up our rosaries and pray them more than ever before. "Say the Rosary every day, to bring peace to the world and the end of the war. I want you to come on the 13th of next month, [July] to pray the Rosary every day, and to learn to read. Later, I will tell you what I want." 'Learn to read' and understand what she is telling us. Do we really understand what we are saying / praying when we repeat the words of the rosary? Do the words speak to us in our heart and soul? Never before in history are her words to be treasured. Or our rosaries to be prayed in the heart. In Mary's first visit with the 3 little shepherd children, she assured them "Do not be afraid, I will not harm you." When Lucia, the oldest child asked where she came from, The Lady pointed to the sky and said: "I come from heaven." Then she asked what she wanted and Mary replied: "I have come to ask you to come here for six months on the 13th day of the month, at this same hour. Later I shall say who I am and what I desire. And I shall return here yet a seventh time." 'O my Jesus, forgive us, save us from the fire of hell. Lead all souls to heaven, especially those who are most in need.' "
"Go again to the Cova da Iria on the 13th and continue to say the Rosary every day. Pray, pray very much, and make sacrifices for sinners; for many souls go to hell, because there are none to sacrifice themselves and pray for them." "Continue to pray the Rosary in order to obtain the end of the war." "I am the Lady of the Rosary. Continue always to pray the Rosary every day. The war is going to end, and the soldiers will soon return to their homes." More than ever before we must hear her message regarding the powerful prayers of the rosary. We must not only hear them with our ears but hear them in our heart. Please take the time to pray your rosary and encourage others to do the same. Pray for our Pope Francis, who will need our prayers, along with all our Priests, Religous and for our Nations Leaders. May they have the spirit of our founding fathers. The children were born in the village of Aljustrel, parish of Fatima which was a protected world of the catechism and scripture. The world around them lived in freemasonry, (which was not kind to the church), and political unrest which would stir a war that would effect the whole world. The angel of Portugal prepares the hearts of the children for the coming of the Virgin by teaching them how to pray. We can gain much from these prayers by praying them with an open heart and letting them sink deeply into our being. (LEFT) Lucia was born 22 March 1907, the youngest of 7 children, to Antonio and Maria Rosa Santos. Lucia was a brilliant child and a 'natural leader'. 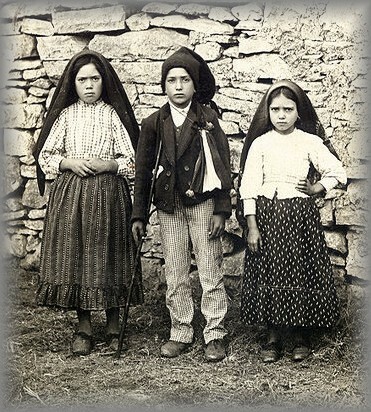 She was able to help her little cousins Francisco and Jacinta through the difficult days following the apparitions of the Blessed Virgin Mary. She entered Carmel in 1948 and became Sister Maria Lucia of the Immaculate Heart. (CENTER) Francisco was born 11 June 1908 and died at home on 4 April 1919 He was a 'very sensitive and contemplative child' according to those who knew him. (RIGHT)Jacinta was born 2 years later in Aljustrel on 11 March 1910. 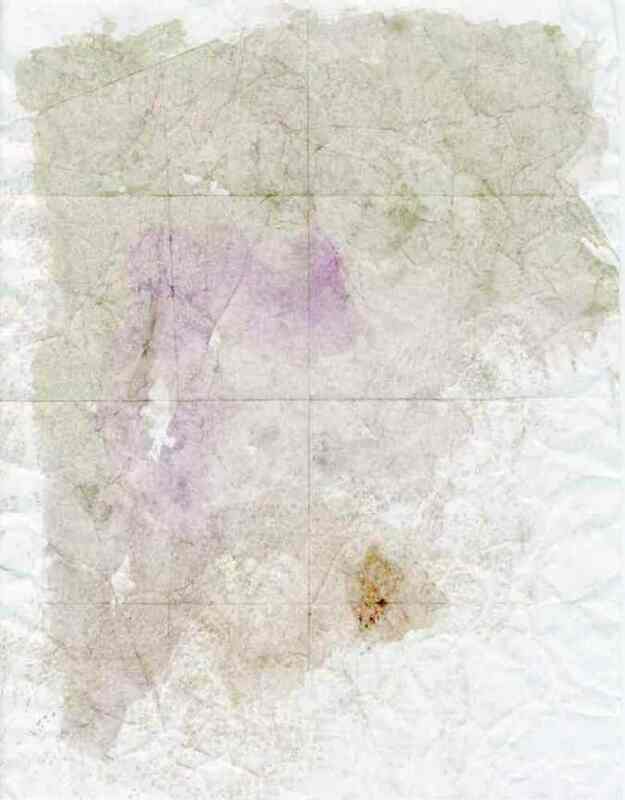 She died a 'holy death' according those who knew her on 20 February 1920 in Lisbon. In honor of the 3 shepherd children, we were inspired to make three rosaries. (Two made May 13th, 2000 in remembrance of Jacinta and her brother, Francisco) - They called the sun, 'Our Ladies Lamp' and the stars, 'The Angels Lanterns'. We honor these two because they set a valuable example to families and their children today on how we should live our lives by saying 'yes' to the Lord so we may fully become who he made us to be. The 'yes' of these children changed the world. The third and most recent rosary (top) was dedicated to Sister Lucia on Feb 13, (the day of her death). 'I Adore Thee' reflects the words spoken by the Angel of Portugal to the children. On the death of Sr Lucia, we designed the first rosary shown. (please note there are 3 sections to this series of 9 rosaries - so dont miss a one! 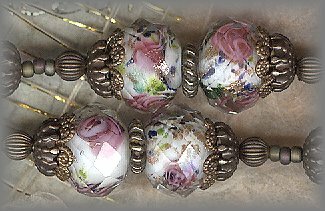 LAMPWORK ROSEBUD BEADS - FACETED! We found these incredible beads about the same time the Holy Father's message came to our ears regarding his consecration to Our Lady of Fathim - and the two thoughts just fit together. 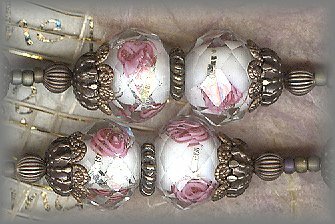 These beads are for Our Lady of the Rosary! 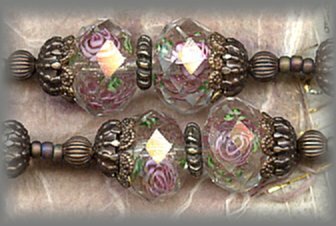 Each little handmade rosebud bead in this series is encased in faceted crystal. 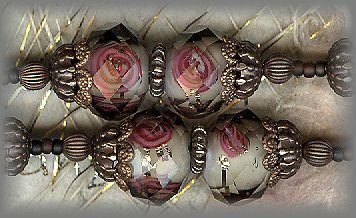 (12mm) Each is framed with antiqued filigrees to compliment their beauty. Each of the rosaries in this series shares two hand made Pater beads instead of just one. (And I am going to make mine with 3!) We find it very beneficial as several prayers have been added to the basic rosary over the years, one being the Fatima Decade Prayer which comes just before the announcement of the next mystery and t he Our Father. Here, on the first large bead, you simply pray the 'GLORY BE'. 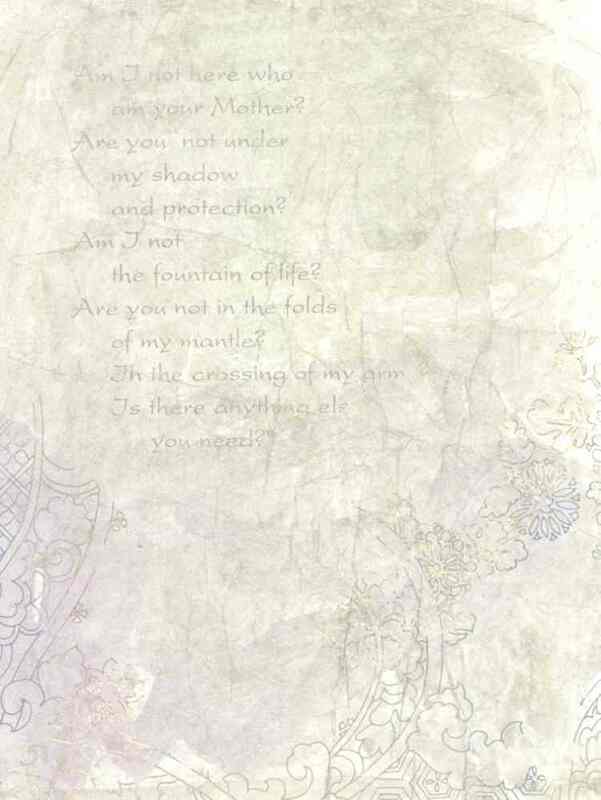 then respond with the FATIMA DECADE PRAYER, (above). 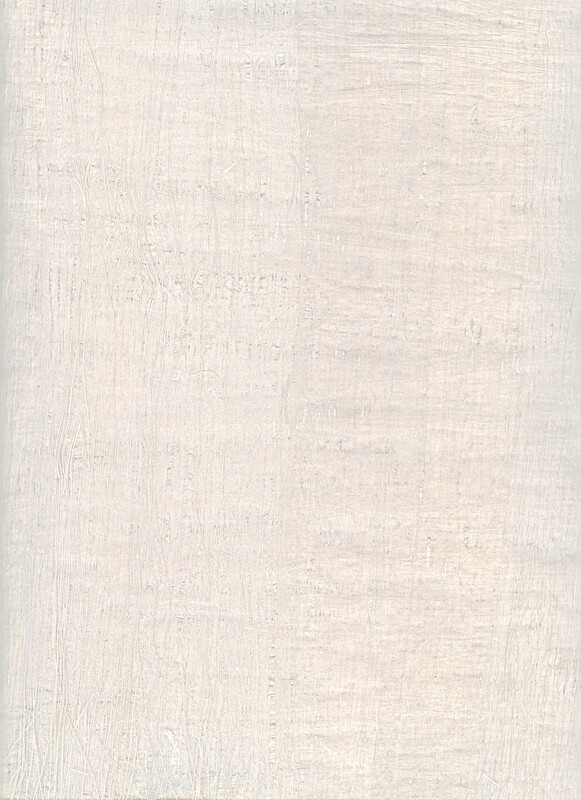 Then move on to the next large bead, announce the next mystery, pray the OUR FATHER then the 10 AVES. I had never realized the Fatima Prayer was to be prayed as part of the standard 5 decade (Dominican) rosary until we moved to the midwest. Living in California and Virginia, had not picked up on this custom. When we moved to the Great Lakes area, I picked up on this prayer along with the 'increase of Faith, Hope and Love', which was new to me, too! --- How long had this prayer been around? Mary asked the children to pray it (see July 13 above). 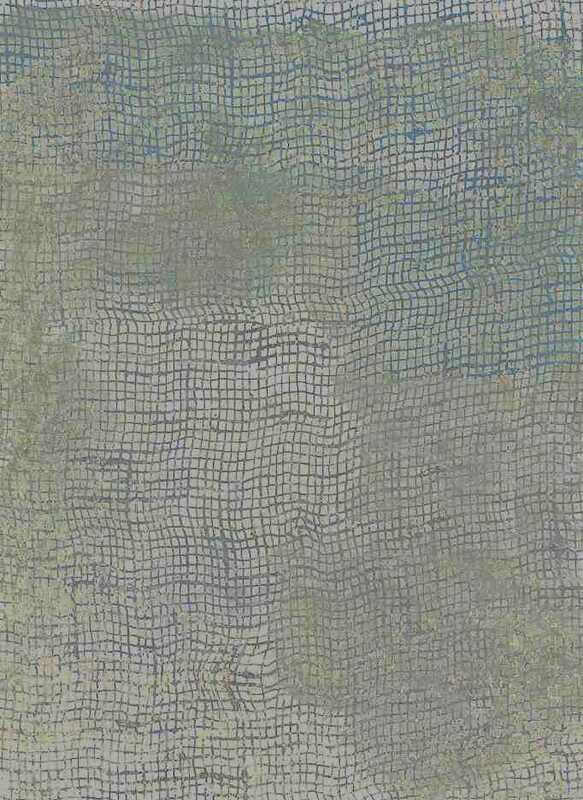 That was in 1917 and found out it had beeen approved for public use in 1930. I see you have included two pater beads in keeping with the Fatima prayer. When I was taught to pray the rosary back in Ontario, I was instructed to pray on the chain or spacer cord the Fatima prayer, also to use the chain or spacer cord to announce the next mystery. Out here, everyone I know uses the pater beads for the Glory Be, the Fatima prayer, and then to announce the next mystery, so the pater beads do triple duty! I did not even know the “Oh my Jesus forgive us our sins…” etc. 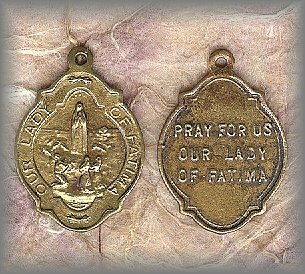 was the Fatima prayer requested by Mother until I listened to Fr. Dave’s homily, however I understand many people do not ever use this prayer. I personally begin the rosary with the Apostle’s Creed on the crucifix, as everyone does, and then by the time I’ve made my way around Mother’s garden, I go back to the crucifix to pray the St. Michael the Archangel prayer. Again, I hear this is not what the majority of people do, don’t know whether it was a Carmelite thing, but it became ingrained in me.